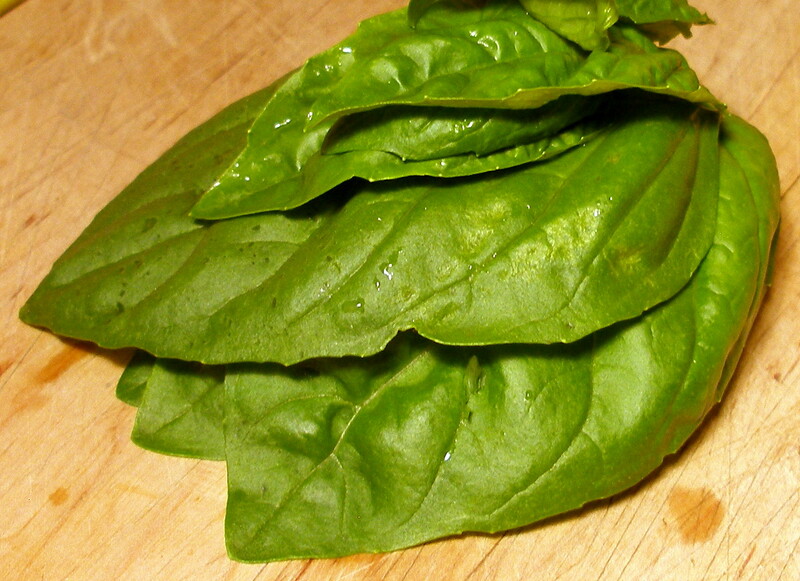 The basil is coming in majestically and that means margherita pizza. Yum. The key ingredient? Freshly snipped and chiffonaded ginormous basil (and homemade crust). Stick that pizza on the grill, crack open a cold one, and enjoy the weekend. Who could resist this orphaned Black Brandywine in a Slurpee cup? This fella arrived courtesy of POD pal BH and his “BFF Mike McGrath”. Evidently this thing is something of an oddball. Not quite heirloom, not quite not. If the interweb is to be believed, Black Brandywine tomatoes are indeterminates that may exhibit both potato and regular leaves (evidence, evidently, of its uncertain roots) and “variable” flavor and texture. In the past, POD’s allowed tomatoes to do their own crazy thing. 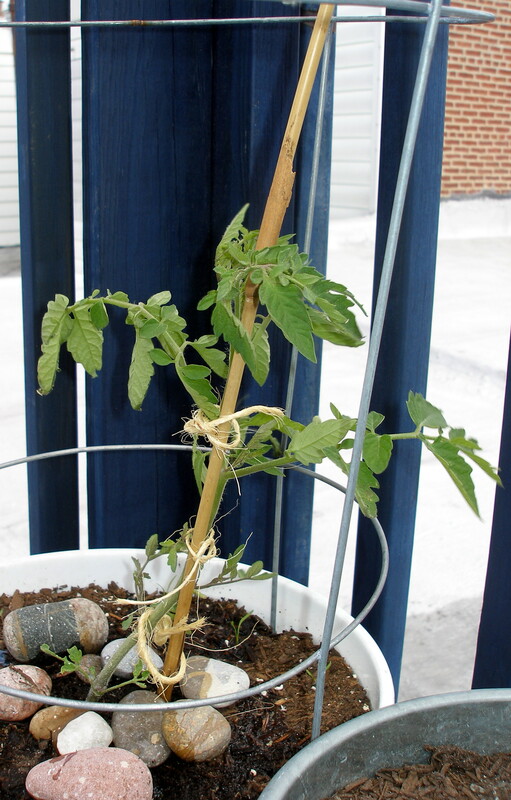 (Largely because my tomatoes usually come down with early blight and need to be pruned dramatically out of necessity.) This year, however, this sucker is doing some modest experimental pruning. 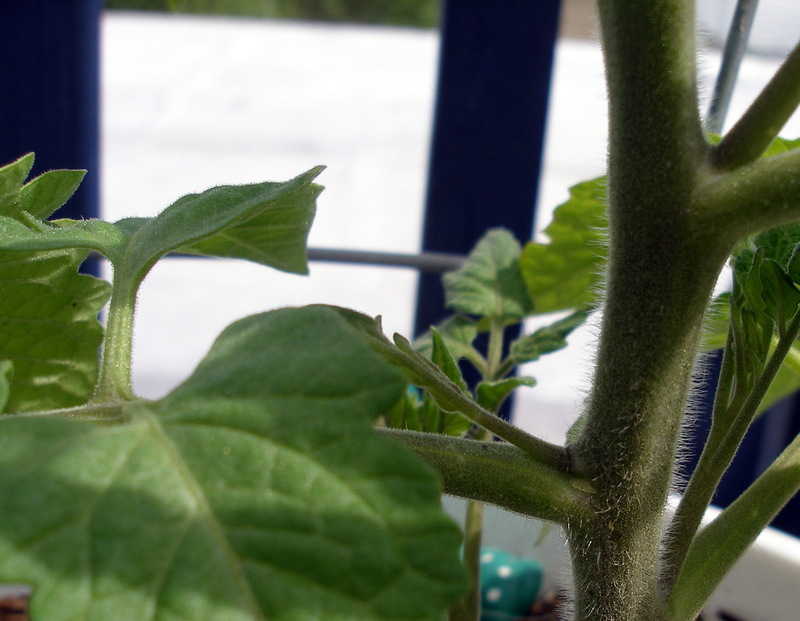 First, determine if your tomato is a determinate or indeterminate. This Isis Candy is an indeterminate — which means it’ll keep growing and growing (ideally). Which also means it may benefit from a little pruning. Chocolate Cherry, also planted on deck this year, is also an indeterminate; however, that one’s gonna’ be free to run wild. After consulting several trusted sources (all of these links will refer you to university horticultural extensions — the third link may be the best) pruning commenced. NOTE: Determinate tomatoes are much more compact and produce most of their fruit in one glorious spurt. Some gardeners prune them modestly, some don’t. This year, POD’s keeping paws off the gold nugget, the only determinate on deck. 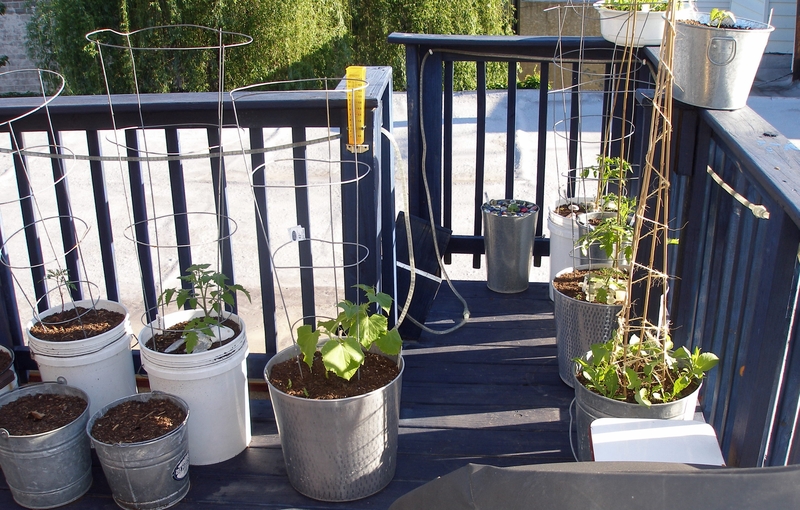 It was a decent idea, one supposes, to attempt to use tomato cages to support the Boothby Blonde’s and True Lemon’s growth. 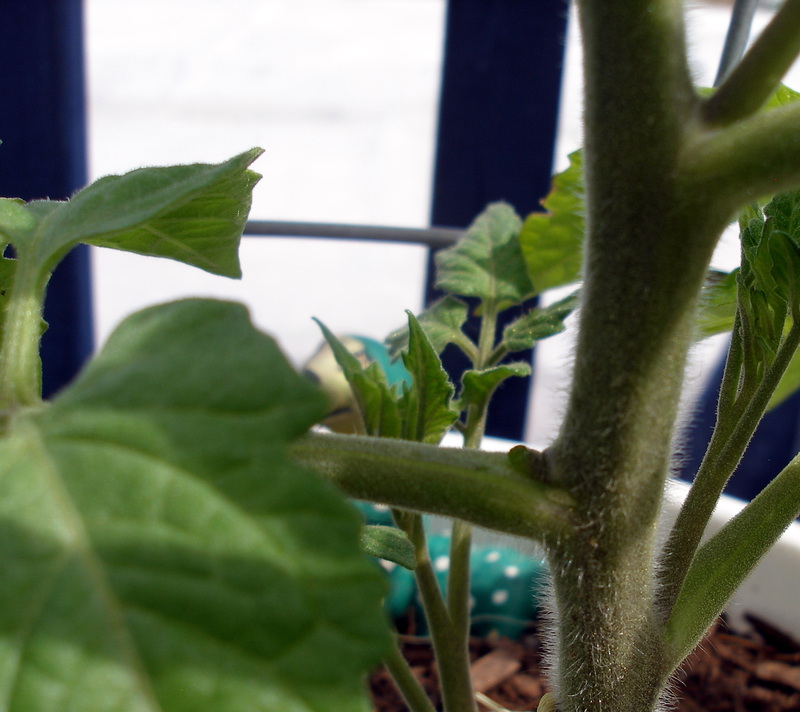 Unfortunately, there may be a reason they’re called “tomato cages” and not well, cucumber trellises. Apparently, the slick metal rods don’t provide the inviting support that the cucumbers’ curly tentacles require. So, once again, yards of jute twine have been introduced. These Boothby Blondes have been lifted and separated and her arms are already grabbing on to their new supports. Any experts out there? Anyone who can tell me what kind of ailment this might be? I’ve visited all my usual diagnostic haunts but haven’t come up with anything terribly promising. 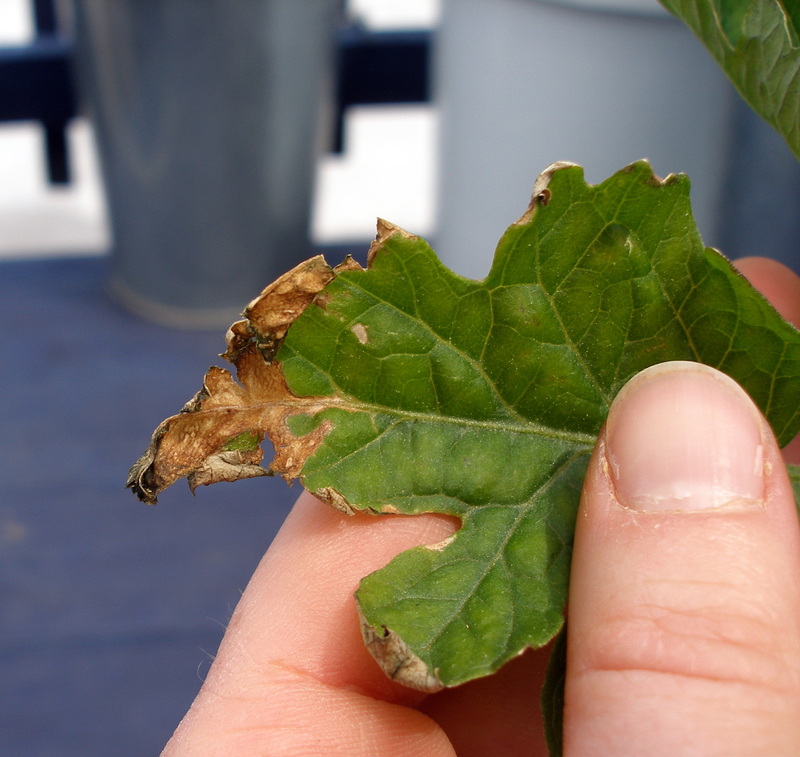 Maybe leaf tip burn caused by over-fertilizing? Or maybe it’s the complete opposite and it’s a nutrient deficiency? This chocolate cherry was planted in organic potting soil, augmented with a handful of worm casings and a couple of crushed eggshells. It has received near-weekly doses of water mixed with fish emulsion fertilizer and a couple servings of diluted milk. Or, maybe it’s just damage from the gale-force winds and the chilly nights that the little blue deck has been enduring this month? Should I lay off the weekly feeding? Should I feed them more? Should I stop obsessing and trust they’ll heal themselves? (Riiiight) Help! Help me! I'm a mystery melon! It’s a necessary evil, thinning is. Last year two melons were housed in a single 5-gallon bucket. That didn’t work so well, honestly. Only 3 or 4 Minnesota Midgets made it onto the table. This year, given just how rootbound last year’s mildew-ridden corpses were, one plant will enjoy all 5-gallons of real estate. POD hopes this will encourage healthier root development and air flow around the leaves. Because the roots of melons and cucumbers are very delicate, don’t pull the rejects from the soil — you may end up disturbing the surviving plants root system. 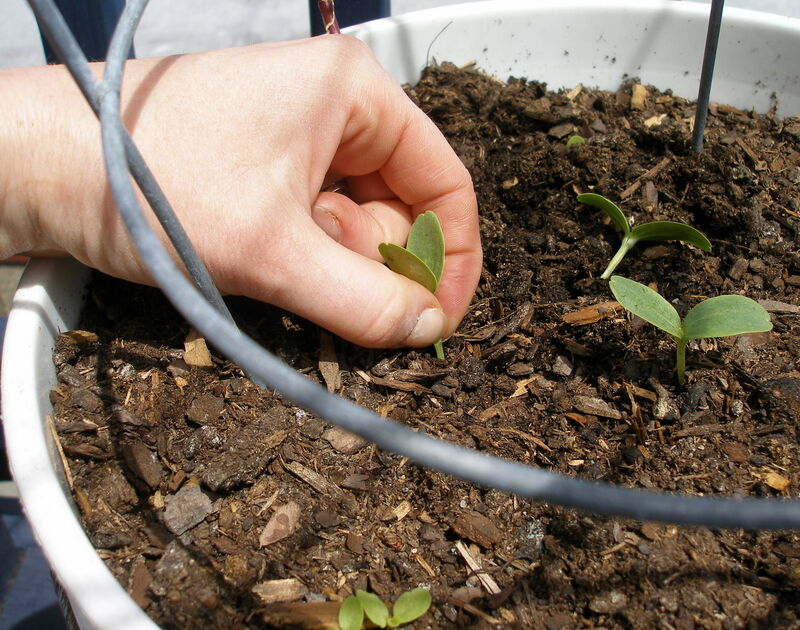 So instead, carefully pinch the doomed seedlings off at the soil line. But guess what! We have a mystery on our hands! So, two 5-gallon buckets of melons were planted. 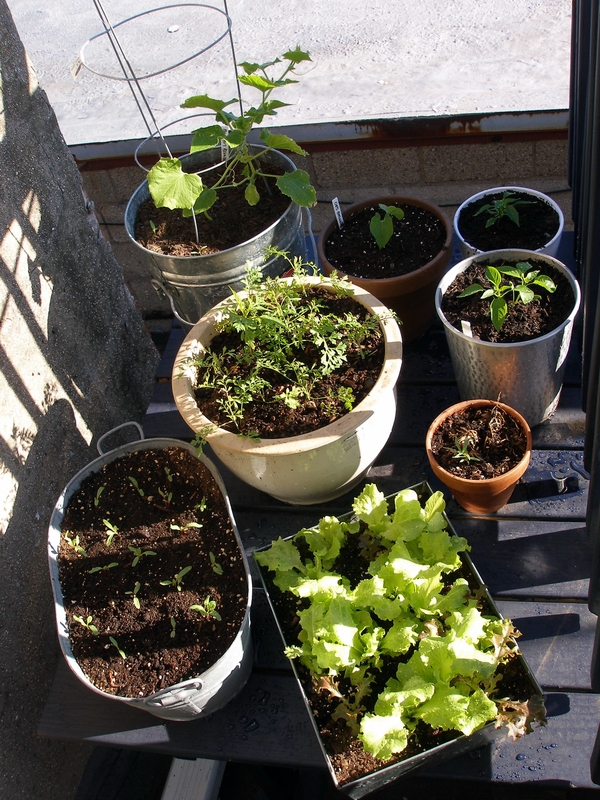 One bucket with Charentais (from seeds saved from a Culton Organics melon) and one bucket with Minnesota Midgets (from seeds purchased at least 4 years ago). One bucket sprouted four healthy seedlings (thinned to one) and the other bucket sprouted not a one. Do you think POD labeled the buckets? Strangely, no. Do you think POD remembers which went where? Not so strangely, no. Whattya’ think? Will it be French or will it be American? Unwisely, POD seems to have lost/pitched the saved Charentais seeds and is disinclined to plant what may or may not be a second MN Midget. Make sense? Thoughts? This recipe is one of those very special “what do we have in laying around the house that’s edible” recipes. Sound familiar? Fill a big, deep pot with water and heat to 140-145 degrees, over low heat. Use something to keep the 2 eggs from sitting directly on the bottom of the pot. Like a cake rack or inverted ramekins or a handful of chopsticks. leave eggs in 140-145-degree water for 45 minutes. Cube (1 to 1 1/2 lb or so) potatoes into 1/2″ish pieces. Place the potatoes on a baking sheet, try to leave some room between each chunk so they roast rather than steam. Roast them for 25-40 minutes, until tender and toasty brown. Half-way through your cooking, flip the potatoes so they turn golden brown on several sides. Dump ’em in a bowl and season with salt and pepper. Fry until dark golden brown (watch them carefully once they begin to brown as they can become carbon slivers quite quickly) in a tablespoonish of oil. Pat dry with paper towel. 12 oz (or so). Chop off the greens and the little root. Wash. Chop into 1″ish chunks. Place in a pot with 1 1/2 c. milk (we used 1%) and bring to a simmer. Toss in 1 tbs rice, 1/2 tsp kosher salt, and a decent amount of black pepper. Simmer for about 15-25 minutes or until a fork easily pierces the turnip. Drain the mixture in a colander set over a bowl and save the liquid. 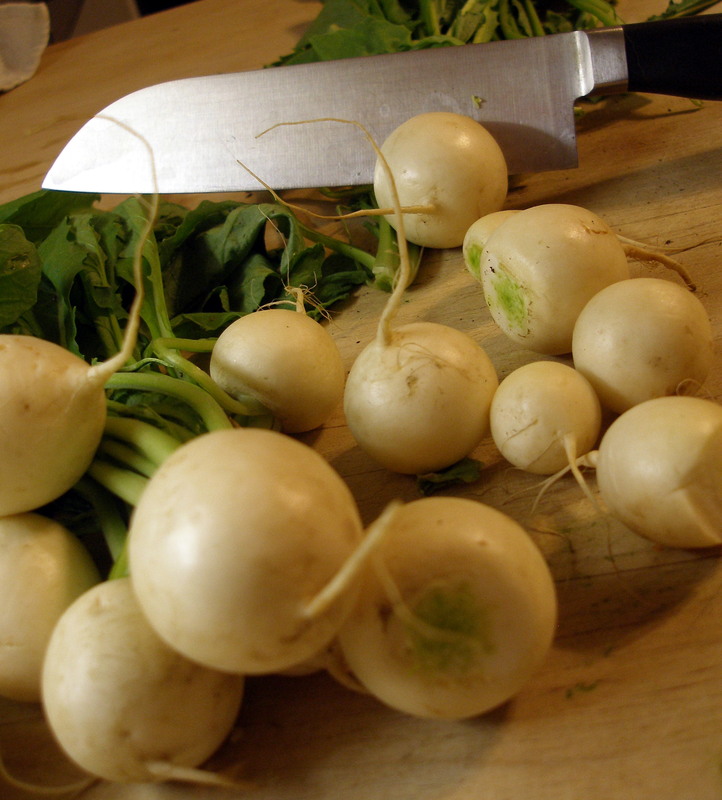 Dump the drained turnips into a blender and puree until smooth. Add a little of the reserved liquid if you need to. Season with salt and pepper. Place a big scoop of turnip puree in the center of your plate. Potatoes go on top of turnips. Crispy shallots go on top of potatoes. Gently crack your poached egg into a small bowl or ramekin and discard the loose white stuff. Place the egg on top of the potatoes. 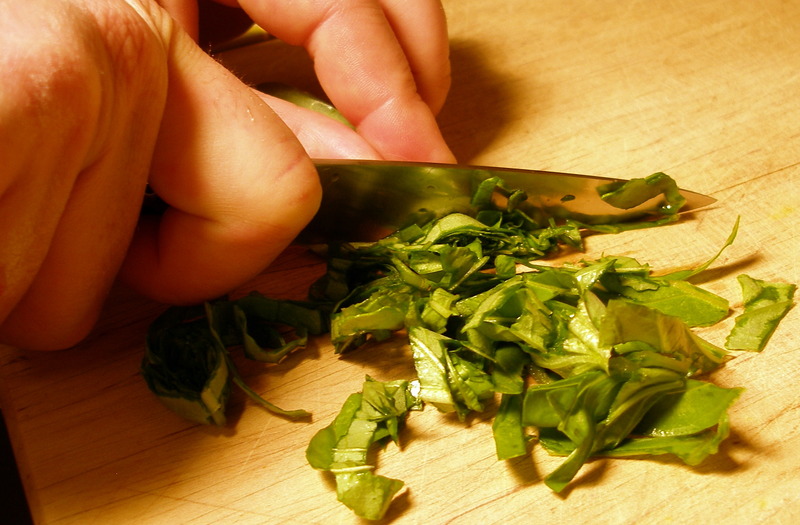 Sprinkle with roughly chopped pepper cress or peppery greens. 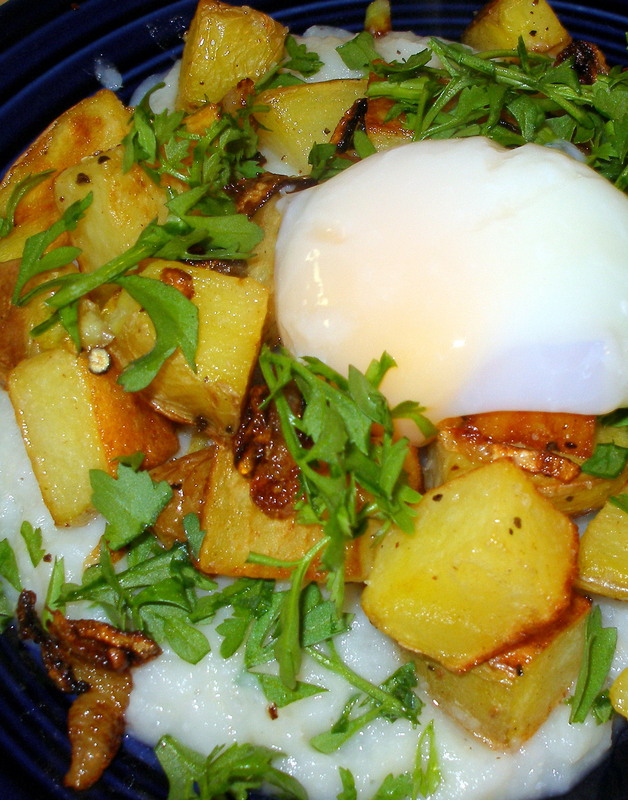 Turnip Puree with Roasted Potatoes, Crispy Onions, Slow-Poached Egg, and Pepper Cress.